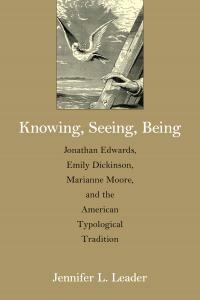 In Knowing, Seeing, Being, Jennifer L. Leader argues that Edwards, the nineteenth-century poet Emily Dickinson, and the twentieth-century poet Marianne Moore share a heretofore underrecognized set of religious and philosophical preoccupations. She contends that they represent an alternative tradition within American literature, one that differs from Transcendentalism and is grounded in Reformed Protestantism and its ways of reading and interpreting the King James Bible and the natural world. According to Leader, these three writers’ most significant commonality is the Protestant tradition of typology, a rigorous mode of interpreting scripture and nature through which certain figures or phenomena are read as the fulfillment of prophecy and of God’s work.